Every so often, a fight is announced that causes the entire sporting world to sit up and take notice. Those with only a passing interest in boxing are suddenly swept up in this sport’s unmatched appeal of two talented, outspoken fighters going head to head. Floyd Mayweather’s win over Manny Pacquiao in May, 2015 was one such occasion. Billed as ‘the fight of the century’, it was an example of how hype and anticipation in boxing can often supersede the event itself. While the forthcoming battle between Deontay Wilder and Tyson Fury may not be on quite the same level of anticipation as that, it still stands to be one of the sport’s most eagerly awaited bouts in a long time. Currently penciled in provisionally for Las Vegas this December, it will be a showdown of two of the sport’s most recognizable and outspoken characters. The winner of this potential match will look to Anthony Joshua for his next fight, with the current undefeated champion odds-on to successfully defend his championships in Povetkin vs Joshua betting. Indeed, much of the appeal of a match like Wilder vs Fury rests on the character and personality of the two fighters rather than their mere qualities as boxers. The simple prospect of a fight between two men named ‘Wilder’ and ‘Fury’ respectively is enough to set the mouth-watering, but to take into account the pair’s boastfulness, and tendency to speak their mind whatever the cost, is to truly set the heart racing. Neither shies away from expressing his opinion, indeed such a philosophy has seen Fury repeatedly get into hot water regarding his comments in interviews and on social media. Wilder’s forthrightness is based more on his own abilities, a repeated mantra that he is at the top of the game for a reason because he is the best. It’s a self-assumption that’s hard to argue with. Wilder is a man who always expects to win and his record is enough to back this up. The American boasts an undefeated run of 40 wins, 39 by KO, a knockout to win ratio of 98%. He has held the WBC heavyweight title since 2015 and his power is almost unparalleled across the sport. It is a sizeable obstacle that stands in the way of Fury, for whom this will only be a third fight since his professional comeback against Sefer Seferi in June. That comeback fight descended into something of a farce, with Fury repeatedly showboating and taunting his clearly weaker opponent, while a brawl also broke out in the crowd, before Seferi eventually quit on his stool after the fourth round. However, August’s clash with Francesco Pianeta proved to be a much sterner test for the still undefeated Fury, lasting the full ten rounds with the Englishman winning on a points decision. Of course, the 30 year old stated afterward that he wasn’t trying to knock out his opponent but was more eager to get the rounds under his belt and dust off whatever lingering cobwebs may remain. While that fight will certainly have helped Fury to get his eye in again after such a long time away from the sport, the prospect of facing Wilder is a much greater challenge. The 32-year-old knocks out opponents for fun, blending an unforgiving powerful right hook with impressive footwork and movement for a 6ft 7in heavyweight. But then again, Fury has a fearsome stature that few boxers can match. The way he advances on opponents in the ring is reminiscent of the great Nikolai Valuev — both possessing the same bold, confident stride, enough to strike fear into the viewer watching at home as well as their opponent. However, while this intimidating stature may be enough to put off lesser opponents, Wilder is unlikely to be fazed by Fury’s presence. Add in the fact that the fight will be on American soil, it must be said that the Englishman will have a mighty task on his hands if he is to defeat the undefeated WBC heavyweight champion. 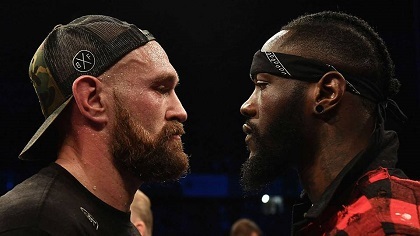 If Wilder is to deliver the victory most boxing followers would expect him to, it’s important that he stays above whatever tactics Fury tries to deploy to distract him or unsettle him in the build-up. The ‘Gypsy King’ as he’s known is famous for his mind games and using the media to unnerve opponents, but it’s difficult to imagine someone with the skill and poise of Wilder falling for such tricks. In the end, this showdown will be decided on who can fight better on the night, who can strike harder and who can move faster. Boxing is a sport in which the small details matter and whoever can apply his talents best will come out on top. Both men clearly possess the ability to end the other’s unbeaten run in professional boxing. The question is whether or not this clash will prove to be too much too soon for Fury, or if this will be the occasion when he truly re-announces his himself as the sport’s most fearsome talent. 1 Response to "Head to Head: Deontay Wilder vs Tyson Fury"
Wilder is going to crush Fury. This is not a 40 year old man. Wilder is in his prime and he is angry. Fury will feel it.